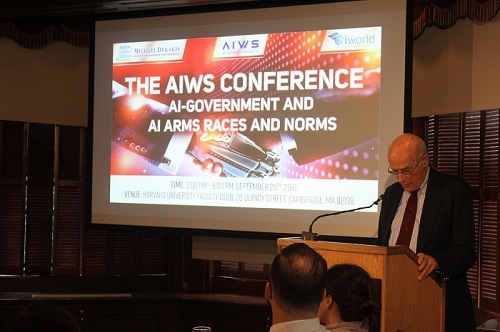 On Thursday, September 20, 2018, the Michael Dukakis Institute (MDI), together with AI World, successfully organized the first AIWS Conference based on the theme: AI-Government and AI Arms Races and Norms. 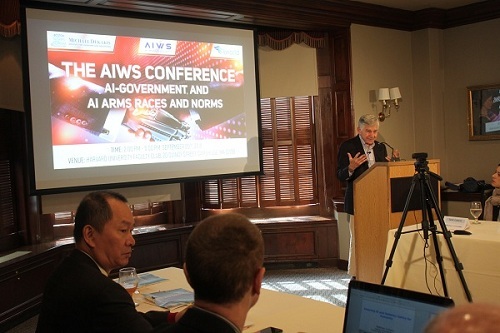 Distinguished Professor Governor Michael Dukakis – Chairman of MDI moderated this conference. – Introducing the concepts of AI-Government, and the AIWS Index. 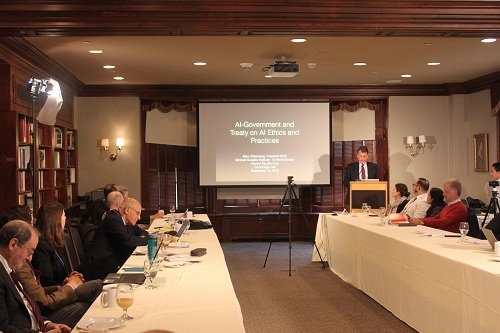 – Prof. Matthias Scheutz, Director of the Human-Robot Interaction Laboratory at Tufts University presented ideas of controlling technology for AI systems and robots, ensuring safety and ethical standards. – Prof. Joseph Nye, Harvard University addressed the problem of norms for AI. – Prof. Marc Rotenberg, President of Electronic Privacy Information Center (EPIC) presented the transparency of algorithm. – Introduced the strategic collaboration between MDI and AI World – The industry’s largest conference and expo on the business and technology of AI for enterprise. – Introduced the idea for an AIWS Square. The concepts of AI-Government were presented for the first time during the AIWS conference. In addition, the AIWS Index for AI Ethics of Governments is also being studied by MDI and strategic partners. 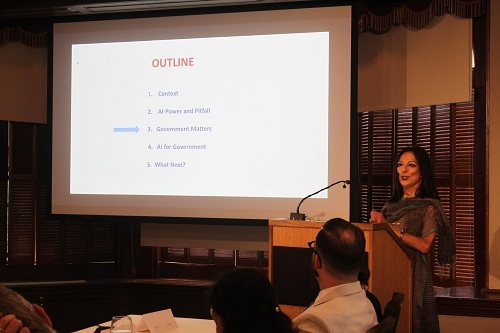 According to Prof. Nazli Choucri, AI-Government is the mechanism by which government operates and AI brings out the diversity in the decision-making process. Three points by Prof. Choucri on how to make AI-Government work are: provision of human oversight, improvement of responsiveness through feedbacks demands and pressures on government and potential corrective mechanisms by government, prevention of the excessive centralized control of any entity used in the AI for governments. 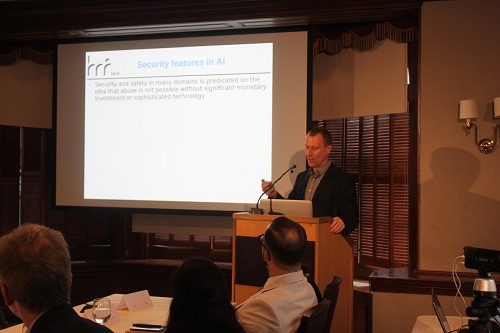 Prof. Matthias Scheutz, Director of the Human-Robot Interaction Laboratory at Tufts University presented his ideas of controlling technology for AI systems and robots to ensure safety and ethical standards for humanity. “AI and robotics technology will both ultimately require built-in ethical constraints to ensure that the technology is safe and beneficial to humans” said Prof. Scheutz. The greatest danger is when algorithms are out of control and people can’t decide what the systems can and will learn in the future. 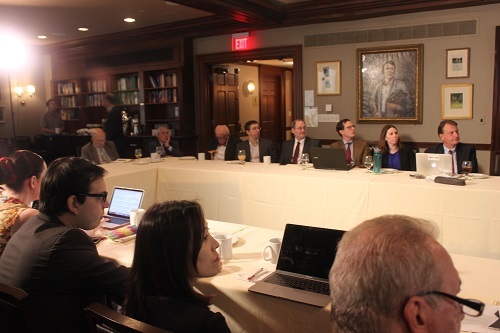 He also pointed out as false some common prevention solutions which he believes are basically insufficient to safeguard AI and robotic technologies. Therefore, Prof. Scheutz believes it is essential to design AI systems from the ground up, even from the hardware level, with ethical provisions that include social and moral norms, ethical principles, and laws that the system cannot ignore and must use in its initial operation. “Many of the debates around the employment of AI techniques have the same focus with the debates associated with the use of computing technology and government agencies back in the 1960s and 1970s”, said Prof. Marc Rotenberg, President of Electronic Privacy Information Center (EPIC). In Prof. Rotenberg’s opinion, the core interest and the protection of privacy is not about secrecy or confidentiality, it is about the fairness of the processing concerning data on individuals. Part of the problem is that as these systems have become more sophisticated, they have also become more opaque. These systems are widespread and have enormous impact on the lives of individuals, for that reason, individuals have the right to know the movement of automated decisions. Together with EPIC, Prof. Rotenberg is sending the message to the United States Congress that algorithmic transparency will be key in the AI age to foster public participation and policy formulation. Prof. Joseph Nye opened his speech by talking about the expansion of Chinese firms in the US market and their ambition to surpass the US in the field of AI. Prof. Nye believes the idea of an AI arms race and geopolitical competition in AI that can have profound effects on our society, however, he says prediction that China will be ahead of the US on AI by 2030 is “uncertain” and “indeterminate” since China’s only advantage is having more data and little concern about privacy. Talking about the norms for AI, Prof. Nye thinks that as people unleashes AI, which is leading to warfare and autonomy of offensives, we should have a treaty to control it. One of his suggestion is that we have international institutions which will essentially monitor the various programs in AI in various countries. Notably in this conference, MDI officially introduced the cooperation with AI World – The industry’s largest conference and expo on the business and technology of enterprise AI. This cooperation marks the determination between two organizations, toward the aim of developing, measuring, and tracking the progress of ethical AI policy-making and solution adoption among governments and corporations. On this event, Eliot Weinman – Chairman of AI World Conference and Expo also became a member of AIWS Standards and Practice Committee. In this conference, the MDI launches the initiatives of building AI Time Square, a place for originating and developing ideals and noble human values in the AI Age. AI Square would include AIWS House to introduce achievements of the 7 AI Application layers in a society in which AI is comprehensively applied to all aspects of the society and life. This initiative is hoped to create a symbol of human culture in the era of AI, especially for the 21th century.